The CI tests running on a raring VM using the latest raring package from the dailybuilds (PPA 0.1+bzr1406+dfsg-0+1406+161~ppa0~raring1) and juju (0.6-1ubuntu1) fail during juju bootstrap. The bootstrapped node installs fine but when it reboots, it fails to boot. Looks like the problem comes from the chain.c32 file in raring: if I replace the file chain.c32 (/var/lib/maas/tftp/chain.c32) with the one from the syslinux package on *quantal* (/usr/lib/syslinux/chain.c32), the boot seems to work. Quantal contains syslinux-common version 2:4.05+dfsg-6 and Raring has the version 2:4.06+dfsg-3. Confirmed, I kicked off a test run, copied over chain.c32 from quantal onto the raring MAAS server, and got all the integration tests to pass (https://jenkins.qa.ubuntu.com/view/Maas/job/raring-adt-maas-daily/6/ARCH=amd64,label=lenovo-RD230-01/console). So I finally was able to do some investigation and the "fix" was quite easy, however, I do not know how convenient it would be. What I had to do in order for it not to fail was add APPEND hd0, like , in the template. Now, I haven't yet found out the reason why in past releases this parameter was not necessary, however, it seems to be necessary now. Doing so basically limits us from installing into any other partition rather than the first HD, howeve,r as it stands in MAAS right now, the installtion is done in the first disk, so this should not cause any major errors. 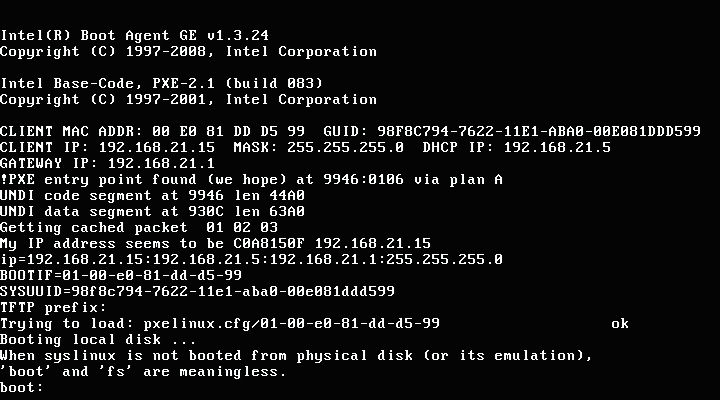 So a little more investigation seems to suggest that chain.c32 now requires to specify a disk in order for it to localboot . So it seems that we will have to add the parameter. Aun sin solucion a este inconveniente?